Bailey Spencer Hardware Store was started in 1897 selling farm equipment, guns and hardware. It was one of the premiere businesses in Lynchburg’s early history. The original building on Main Street burnt down in the mid 1960’s. 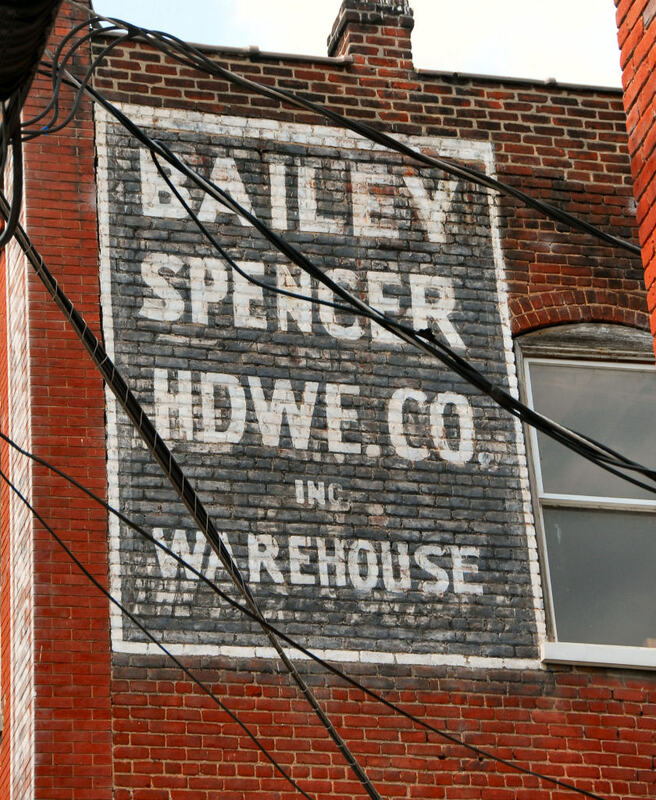 Following the fire, the business moved down to Commerce Street where one can still see the Bailey Spencer sign on the side of the Renaissance Theater. Between 1990 and 1991 the business was bought out by a group of owners who wanted to capitalize on the profits and liquefy the business. At this point, Scott Pearl, who was a vice president for a few years after coming over from several other local businesses (Craddock Terry and Winebarger), decided to make a move. With the terrible news of such a rich historic business closing, Scott decided to buy out the remaining inventory from the owners and take the business to 1216-1218 Main Street. Through determination and hard work he was able to save one of Lynchburg’s oldest businesses through a period where downtown Lynchburg was not business-friendly. Today, Bailey Spencer operates still at 1216-1218 Main Street, direcly across from the Farmer’s market and is a favorite place to visit for locals as well as visitors. The building itself has as much of a history as does the business. Being built in 1854, it was the original home to Lynchburg’s First Presbyterian Church. Bailey Spencer has expanded to be more than just a hardware store, offering three stories of stock from commercial doors and hardware, architectural antiques, historic stained glass, doors and columns to designing and producing chippendale doors. They are a licensed and insured contractor bringing the best to Lynchburg and Central Virginia.